I am beyond excited that we are having cooler weather at last. Fall colors are a wonderful medley of warm shades, making you want to wrap yourself up in them. Here are a few of my favorite fall hues that I gathered inspiration from seeing some beautiful foliage this last weekend! 4. In love with midi skirts. Enough said. 5. Boots Boots Boots. Obsessed! Have you seen the leaves starting to turn? I love that green bag also and anything cable knit is a favorite of mine!! Great picks girl have a lovely day!! that bag! 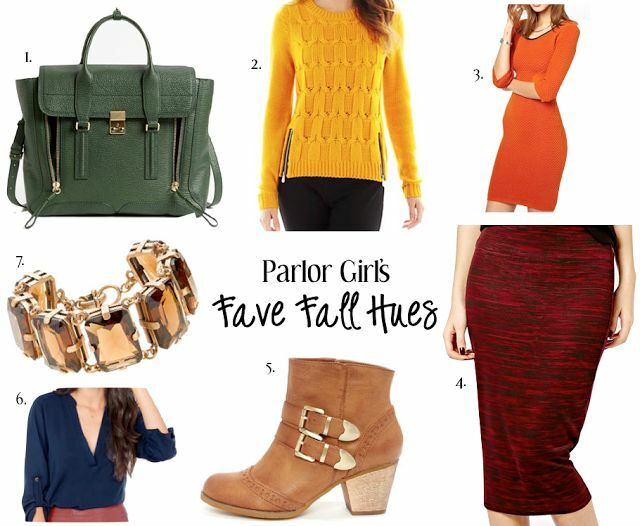 so perfect for fall, and i am seriously swooning over that mustard sweater. comfy & cozy with just the right amount of detail! Fall colors are my favorite clothing colors! Olive green is always a favorite of mine, but I'm loving all of the jewel tones this year too! Love these pics, especially those booties.. so cute! LOVING that green bag...so fabulous! Great Fall Fav's. The Phillip Lim bag is a must. Recently I've been wearing my black one daily with all my outfits. Thanks for sharing this ankle boots from Lulu's. I've been on the lookout for a pair of black just like these! :) thanks girl!